The furniture that people keep throughout their home has value to their owners, whether that value is monetary or sentimental. The monetary value of furniture is obvious as furniture sets tend to be pricey, but people usually value furniture that evokes memories of the past more than brand new furniture sets. Furniture that is passed down between generations of a single family carries memories of past events and lost relatives that brings happiness and comfort to current generations. 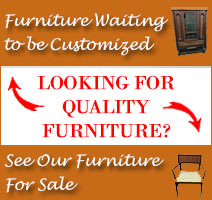 At Furniture Medic by MasterCare Experts, we understand the sentimental value of handed-down furniture and we are ready to provide furniture restoration and refinishing services to help these pieces last for future generations. At Furniture Medic, we recently had a customer reach out to us about restoring a vintage wooden desk chair. The customer told us that the chair itself is rather plain and probably not worth much, but she has memories of her grandmother using the chair at her desk. 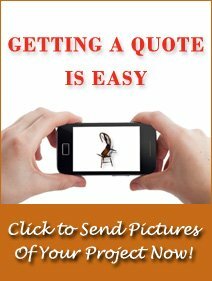 The chair has since been abused and it was important to the customer to have the chair restored. She brought the chair to our furniture restoration experts to restore it to the condition it was when her grandmother was using the chair. The customer reached out to us by phone and sent a picture of the chair, along with the color wood stain she wanted for the piece. 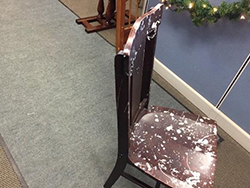 The chair arrived at our shop in disrepair and splattered in white paint. The chair itself had been painted as well which covered the original wood stain. 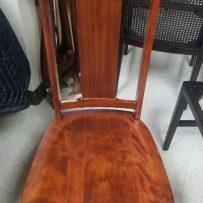 We accepted this challenge to repair the desk chair, remove the paint splatters, and restore it with the wood stain that the customer requested. When we got the desk chair from the customer, it needed to be repaired and stripped so the new wood stain could be applied. 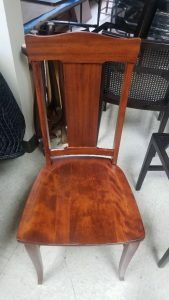 Our craftsmen specialize in providing repair as well as refinishing and restoration for wood furniture and we were confident that we could restore the chair to the condition that our customer remembered. We started by making the necessary repairs to the chair so that it can be used again safely. 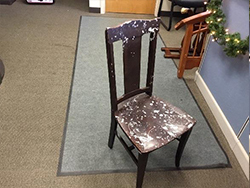 After the repairs were completed, we stripped the chair to the wood to remove the paint job and the paint splatters. Our craftsmen also inspected the chair to repair any surface damage including scratches, dents, and other blemishes. After stripping and repairing the chair, it was ready for the new finish and wood stain. We applied the wood stain chosen by the customer as well as a factory finish to protect the stain and the chair. Precision Repair: We will repair any damage or blemishes to the surface of the wood including gouges, scratches, watermarks, dents, burns, and stains. Re-Gluing/ Minor Adjustments: Our craftsmen will repair damage to wooden furniture with effective gluing and readjustment techniques. In this case, we had to make repairs to the chair so it could be used again. Finishing: Our deluxing process eliminates scratches and other minor blemishes from the surface. Painting/ Color Matching: We offer a wide variety of paint and wood stain colors so we can provide effective color matching to get the right color or finish for the furniture piece. In this case, the customer requested a specific wood stain to restore the original appearance of the desk chair. Restoration/ Finishing: Our water-based factory finishes help protect the wood furniture piece as well as the stain from damage or blemishes. We were happy to return this desk chair to our customer repaired and refinished with the requested wood stain. She can now proudly display her grandmother’s chair in her home and reminisce about her grandmother sitting in the chair at her desk. Our craftsmen take pride in bringing new life to furniture pieces that have sentimental importance to our customers. If you have a piece of wooden furniture that has fallen into disrepair or has an old, worn out finish, our experts at Furniture Medic by MasterCare Experts can revitalize it with our wood furniture refinishing and repair services. We will make sure the piece is in usable shape and we can paint or refinish the piece based on your preferences. You can call us at (630) 653-3131 to start the process or submit your project through our website.